Most of you are probably way ahead of me and have had your outdoor Fall decorations put out for quite a while. I just recently completed decorating my front porch and am finally ready to share it. It really took me a long time to get my Fall decorating mojo on this year. I had planned to get it all done over Labor Day weekend, but it’s so hard to be inspired to decorate for Fall when it’s 90+ degrees outside! But, we finally had some cooler days and even cooler nights and that really revs my Fall engine, especially when it comes to decorating the front porch. Knowing that I had a group coming to go shopping for Furniture Market samples in High Point was a big incentive too! 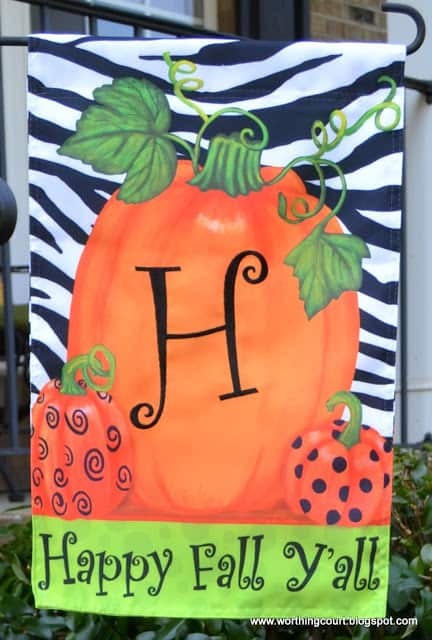 I was so tickled when I found this outdoor flag. I’ve been looking everywhere for a cute one for Fall. I hope it helps to make you feel welcome when you approach the house. 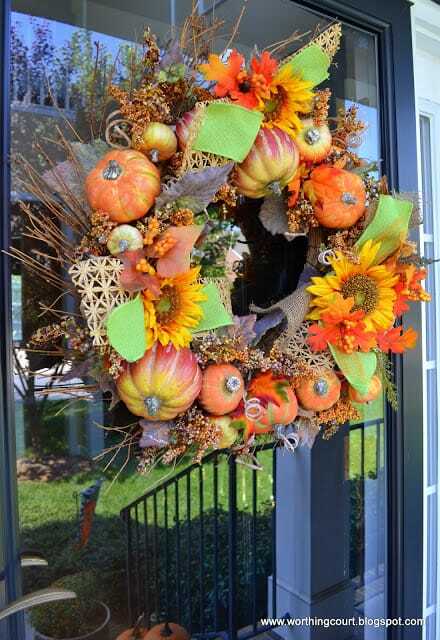 My pumpkin wreath has seen many a Fall season on my front door. Every year I think it will be its last, but I spruced it up and here she is once again. My front porch is long and narrow. Plus it is surrounded by railing and shrubbery. It makes it impossible to get a shot of the whole thing that isn’t obscured by the railing, even with a wide angle lens. So I’ll show you one end at a time. To the left of the front door, sits an urn with the grapevine pumpkin that I added this year. And here’s the little sitting area off to the right. Totally off topic, but want to know a little secret about me? I have trouble with my left and right. I know which is which, but I have to stop and think which hand I write with – that would be my left. Can’t tell you how many times I’ve given people the wrong directions! I would sure love it if you’d come set a spell! I just had to show you a picture of it at night so that you see the grapevine pumpkin lit with its orange lights. 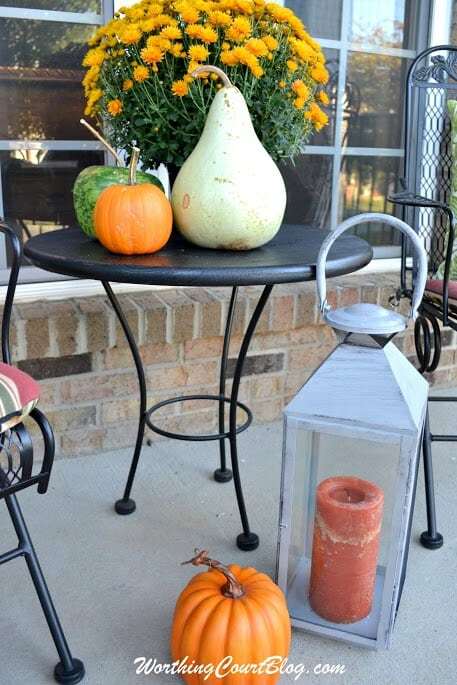 Click HERE to take a tour of my beachy fall porch. And click HERE to see all see my Fall Home Tour. 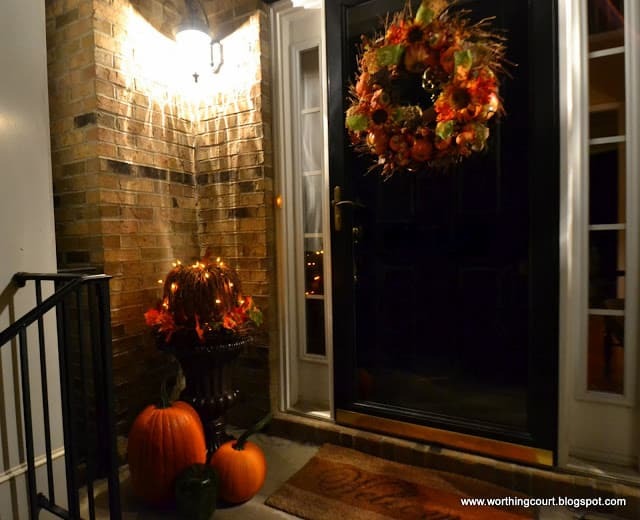 Want to see what the Fall decorations on my front porch looked like last year? Click HERE. Here’s a little peek. 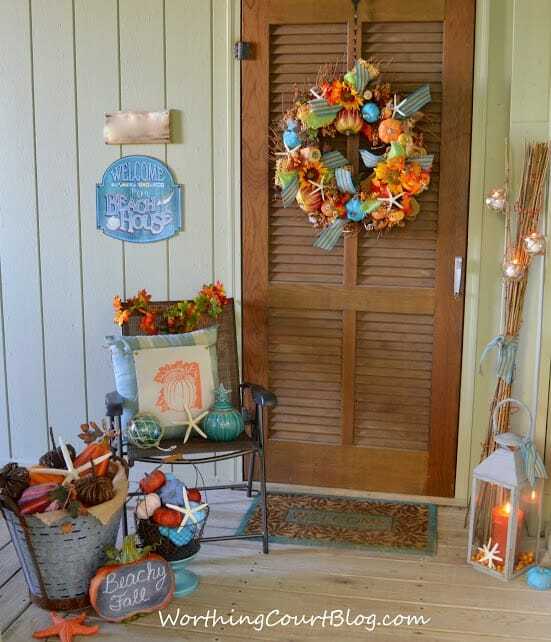 Beautiful Suzy…love the lighted pumpkin and the gorgeous wreath on the door…such a Happy Fall Y’all porch….oh..love those pillows! Your porch is so pretty! I love your wreath and the urn with the lit pumpkin is so cute! I’d like to invite you to share it at my party, Twirl & Take a Bow at http://www.houseontheway.com. Hope you can join in on the fun. Your front porch looks great. I am so behind. Haven’t bought a single mum or pumpkin yet. Maybe after the conference and life gets back to norm. 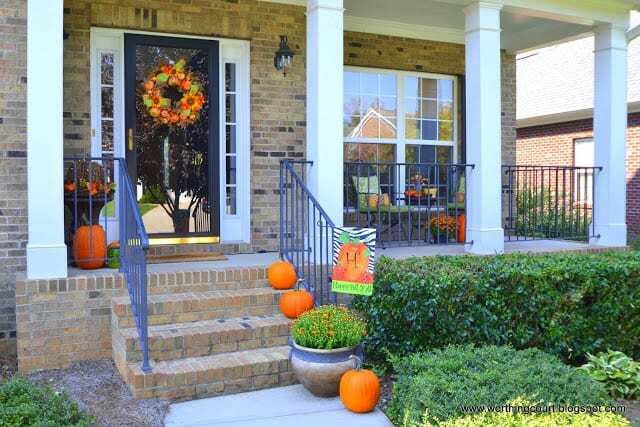 Your front porch looks fabulous decorated for fall! Love the pumpkin in the urn and the wreath. And your pillows are very pretty, as well! Your porch looks great. I love all the touches, the seating area looks so inviting anf I love the urn. Suzy, your porch looks great! It’s so warm and welcoming. 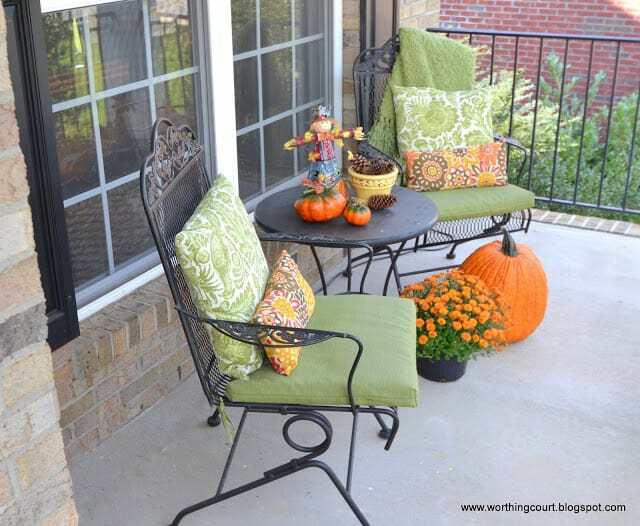 I love the pumpkin in the urn and the sitting area is so lovely. I haven’t done a thing, yet…except the wreath on the door. what a wonderful color splash on your front porch! Suzy, your wreath looks great on your door. My wreath is seeing another year, too! 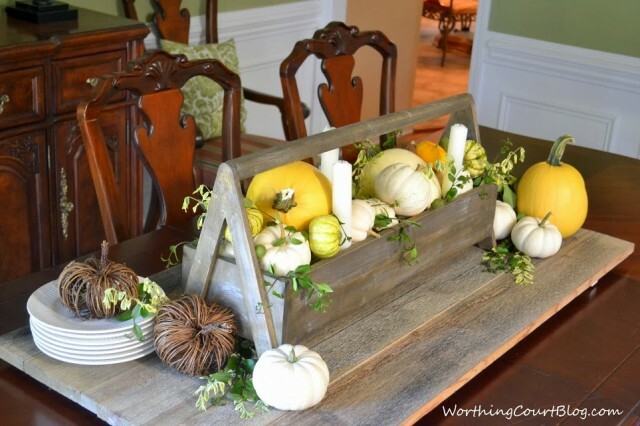 Love the lighted pumpkin in the urn, and I may have to steal your idea if I can work up the courage to take the sweet potato plants out of mine. Can’t wait to meet you this weekend. Love your front porch and it does look welcoming!! Love your ideas!!!!! This is so welcoming and pretty Suzy! 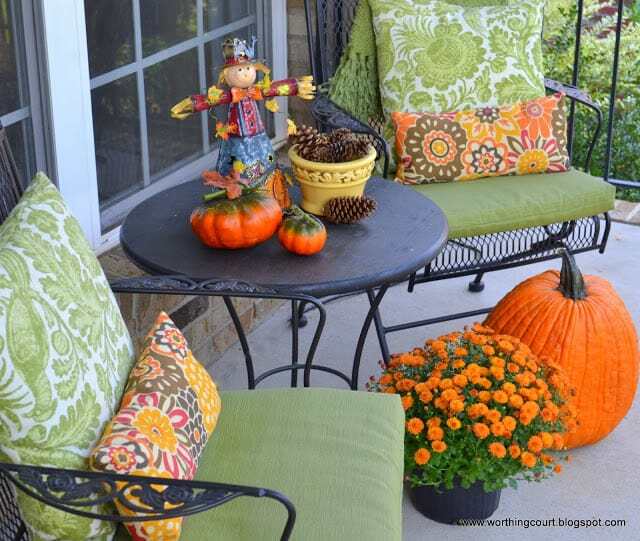 I love the fabric on your chair pillows and the grapevine pumpkin is perfect. Have a good time at the conference this weekend…you have worked so hard! Have trouble giving directions?…and maybe navigating! Really!! Remember the time we headed out for a weekend in MB, got so lost we had to turn around and come back to Greensboro and start over!!! And we weren’t even “seniors” then! Thanks goodness for GPSs!!! Loved your porch…it IS so welcoming! also…the wreath it’s to die for!!!!!!!!!! Your porch is gorgeous, Suzy! Love your pretty patterned pillows in the sitting area, too! As someone who got to see this fall front porch in person, I can attest that it is definitely welcoming. I thought the entire vignette was gorgeous, and so festive. And remember, Suzy, Left is the one that makes the L. A college friend always had to remember that way! So, so pretty and perfectly fall! 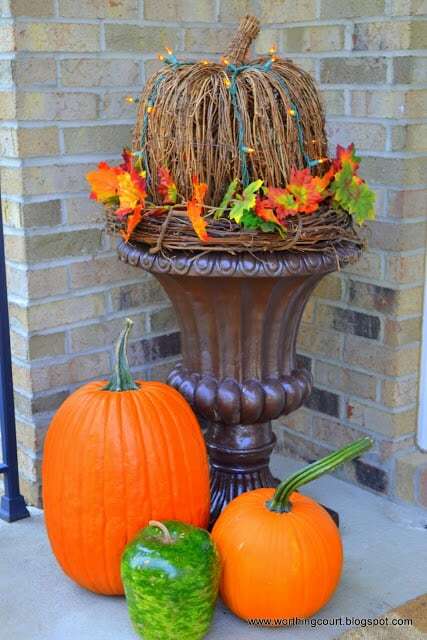 Love your wreath and the urn with lighted natural pumpkin. Thanks for sharing. 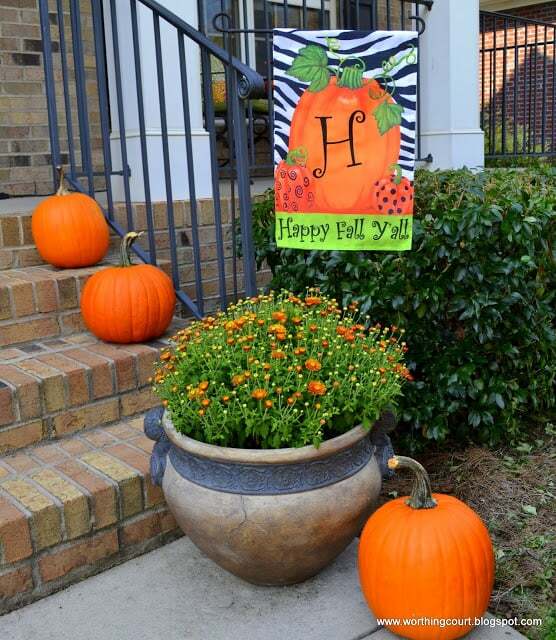 I just love the fall decor on your front porch…it is so inviting!! Your front porch is so lovely and truly inviting, Suzy! Love the little flag! Love it! That wreath is my favorite, I think it still has many years of good use! 🙂 Everything looks so Fall-ish and inviting! Your porch looks wonderful for fall. I love your new flag! Your porch looks BEAUTIFUL!! I love how it turned out! A beautiful front porch, welcomes me right in – love your new pumpkin, and the flag, well I’m jealous 😉 Thanks for sharing all the beauty! Very NICE! Classy and welcoming. Not over the top.